Overview: Take a two-tank guided tour of the RMS Rhone, a sunken British mail steamer that sank offshore Tortola during an 1867 hurricane Watch for currents as you explore the mostly-intact bow in 80-feet of water, then glimpse the “lucky porthole” and captain’s silver teaspoon on a second shallow dive to stern. See a resident 800-pound turtle, moray eels and sharks. For advanced divers with “C” card and one dive completed within the past 2 years. 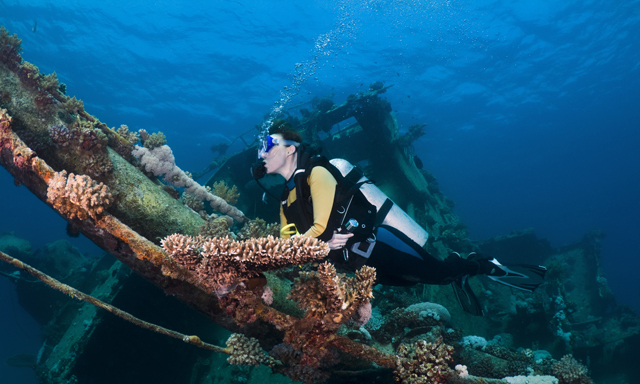 Highlights: RMS Rhone: Explore the ruins of a British mail steamer destroyed in an 1867 hurricane on two guided dives. Deep Water Dive: See abundant fish life, among encrusting coral as you examine the mostly-intact bow in 80-feet of water. Shallow Dive: Swim past the “lucky porthole” and “captain’s silver spoon” while exploring the stern in waters 15-50 feet deep. Tagged excursion, Scuba Dive, Tortola.